Divine Coincidence, the term an old friend of mine (thanks Melva) uses to describe those moments in life when the unexpected happens in an otherwise routine day. These might be moments of “small world-ness” (like flying to Paris, taking a train, bus, and taxi to an old castle, walking into the grand hall of the castle, and seeing someone you know from back home), or they might be moments of “serendipity” (like a dear friend buying a cabin and needing furniture at the same time you are downsizing your father’s house), and sometimes, on rare occasions when the universe aligns the stars, they are moments that takes your breath away. This is one such tale. Carmen and I were in the midst of a large remodeling project on our rental house. Her mother and husband were scheduled to move in in a few short weeks. 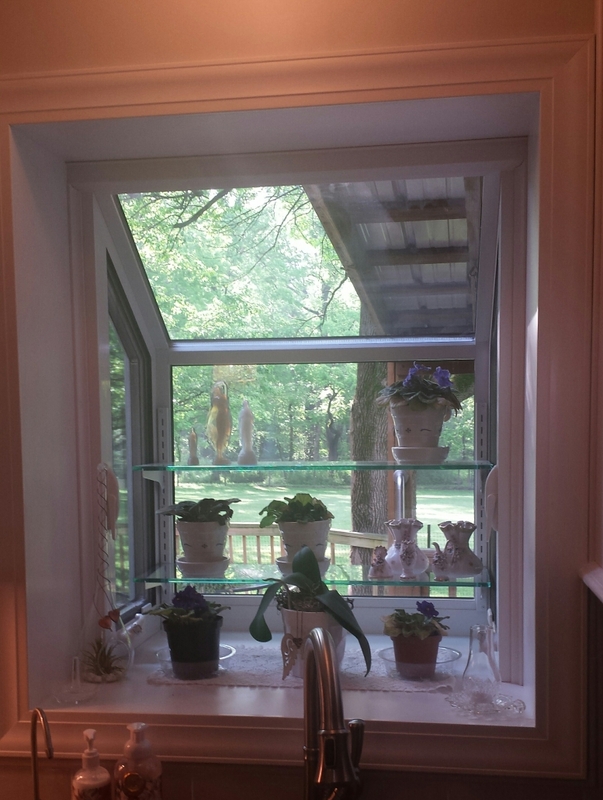 Carmen wanted to give her mom a special surprise…a garden window in the kitchen. 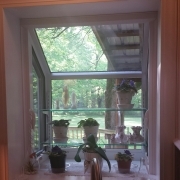 She called a couple of local window companies and settled on Faerber’s Bee Windows. Ty put down the paperwork and began to explain. Carmen is smiling now, still not sure where this is going, but knowing we have been battling those little devils for years. Just the week prior, we had been talking to our friends John and Ruth Vess about “mole eradication techniques”. The maze of tunnels criss-crossing our yard flashed in her mind. She was about to warn him not to get his mole advice from me. In a flash, memories bombarded Carmen as she remembered the post about that old sprinkler head. Months before, as we packed my dad’s belongings and moved him to an apartment, she had repeatedly told me to be sure and claim some of dad’s tools. I would mumble something about having all the tools I need and then some. I didn’t need anymore tools, I insisted. But, she knew better. Her dad had passed away 22 years ago and she still clings tightly (and occasionally lets me use) the tools of his that she had managed to keep. She knew my dad would never be able to use them again, and he, himself would be gone from us one day. She knew we would want them. I finally decided she was right. I selected a few things to save, among them was the old sprinkler head. It was the memory of her father and his own battle with cancer that now flooded her mind. As Ty finished the story of his upcoming cancer surgery, both he and Carmen were now crying. As they stood in the garage of the rental house, Ty declared, “You know, I couldn’t figure out why they sent me out on this job. I don’t typically make sales calls. I’m one of their most senior Project Managers.” At that moment, they both knew the answer. A few days later, I had a chance to meet Ty when he delivered the estimate for the window. He thanked me for the post as he retold the story. He and his wife were leaving in a couple weeks for a trip of a lifetime to Belize. His surgery would follow their trip. As we talked, I learned more of his background. Prior to joining Bee Window, he had been a sports reporter and columnist. His column had been syndicated and appeared in papers across the midwest. I reached out to Ty this week to see how he was doing. Their trip to Belize was a magical as you might imagine, sunrises on the beach, hiking ancient ruins, swimming with nurse sharks and giant sea turtles. But the surgery has had to be postponed until June for a variety of reasons so he is still facing that with a bit of trepidation. Call it a serendipitous moment, call it a small world moment, or call it a Divine Coincidence, it’s a moment I will remember every time I put pen to paper (or fingers to keys, as the case may be), it is a moment I will never forget. Ty, I am thankful my words touched your life, your story has profoundly impacted mine, thank you for sharing it with Carmen and me! Beautiful story – loved the contrast of “serendipitous moment”, “small world story” and DIVINE COINCIDENCE . . . your RIVERS OF THOUGHT stories always bring a tear and a smile! As the official #1 “groupie” for Rivers of Thought I give this posting ten thumbs up (not bc you mentioned me but it helps). You made me laugh, you made me cry (as soon as I read the phrase “The Sprinkler Head”, you even made me hum “You’ve Got a Friend”. God has gifted you with the ability to share your unique perspective of everyday life events thru the landscape lens of love, joy, pain, friends, family (not just blood but those that truly care) and often with a multi-generational value. Thanks, Buck! You kind words and friendship mean more to me than you know.